The right Rugs can change the look and feel of a room in an instant! Whether you’re using them to define a space, or to add warmth with a splash of colour, or to hang on a wall, Rugs are a great tool for interior design. At Contemporary Heaven we have a plethora of different rugs in a variety of styles, colours, and textures. If you’re looking for a stylish or funky Rug to brighten up your home, you’re in the right place. Just type RUGS into the search bar at the top right of the page, and prepare to be amazed. Below are just a few of the huge range of Rugs we offer. All the way from Kashmir, this stunning Rug is available in purple or red, and in two different sizes. The handmade Rugs are chain stitched using top quality cotton and wool, then the designs are imprinted using natural fast dyes. This ‘Carnival’ design features unique shapes and patterns to give your room a contemporary feel. 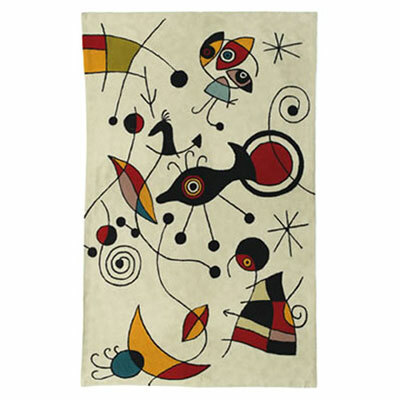 We also have the Zaida ‘Miro’ style rug in cream or red. Both styles are ‘fair trade’ and made by craftsmen in the Kashmir region of North India. With bright and bold colours like these, it’s always best if you keep them out of direct sunlight to prevent fading. Handmade by Dreamweavers, the cobble range are made from a soft touch chamois material, giving a touch of luxury and comfort to any room in the house. There are also a range of matching cushions, and they all come in a vast array of colours, such as black, white, cream, grey, orange, and lime green to name a few. These Rugs, with their 3D appearance, will stand out on your floor and brighten up any dull space instantly. We have a range of elegantly designed rugs by well-known designer Calvin Klein in stock. If you browse the site you’ll find the Ravine, Lowland, and Monsoon Rugs in stylish neutral colours such as bone, thistle, shadow, beachrock, and flint that will add sophistication to your living room, dining room, or bedroom. We have many more Rugs available so use the search facility and look at your leisure until you find the perfect match for your home.